Chelsea have arrived in Japan to a warm welcome from a loyal band of supporters hoping that a strong showing at FIFA Club World Cup Japan 2012 will generate a wave of “blue fever” and widen the club’s fan base here in the Far East. While the English Premier League enjoys great popularity in Japan, much of the media coverage focuses on Manchester United, who signed striker Shinji Kagawa this season, and Southampton, home to defender Maya Yoshida, who guided the Japanese Olympic team to the semi-finals in London. Teruhito Komatsu, 24, has his fingers crossed that Chelsea’s debut at the global club event will help the European champions grab more of the media spotlight. A member of the Chelsea Supporters Club of Japan, Komatsu’s passion for football—and the Stamford Bridge club—was sparked by former Blues legend Gianfranco Zola. During the 2002-3 season, Komatsu was not even a football fan. That all changed when he saw Zola on TV. I hope Chelsea will win a title that will go down in their history. The Italian attacking midfielder’s silky skills astonished Komatsu and piqued his interest in football. Komatsu studied the game so extensively that when he was a university student he won a football quiz programme on TV. His prize was a ticket to the 2008 UEFA Champions League final in Moscow, which Chelsea lost to Manchester United. “It was all thanks to Zola,” Komatsu, who is now one of the Chelsea Pitch Owners that jointly share control of the Stamford Bridge pitch, told FIFA.com. This year, Komatsu was in Munich—this time at his own expense—to watch Chelsea win their maiden Champions League crown when they edged Bayern Munich in a penalty shoot-out. Komatsu was offered a football media job after graduating from university, but instead has set his heart on saving up to live in England. “I really want to watch football over there,” he said. Before that, he will see the Blues in action when they take on Mexico’s CF Monterrey in a mouth-watering match-up in Yokohama on Thursday. According to Komatsu, lifting this trophy would go a long way to making Chelsea a household name in Japan. His sentiment is shared by Ryota Matsumoto, a 23-year-old living in Tokyo who works in football media and has been a Chelsea supporter for about ten years. He is a member of the Chelsea Supporters Club of Tokyo, which has about 100 members and organises game-watching events and futsal five-a-side tournaments against other supporters clubs in Japan. “My fondest memory was when Chelsea TV did on a story on the Tokyo supporters club while we were watching a game. We even got some space in the club’s official magazine. I’ll watch them play in Yokohama, although it’s a shame John Terry won’t be there,” Matsumoto said of the Chelsea captain who was ruled out of the tournament with a knee injury. Matsumoto, who said the first replica Chelsea shirt he bought was that of Argentinian midfielder Juan Sebastian Veron, is hopeful the London club’s visit will not be their last. About 200 Chelsea supporters from around the world are expected to attend a party in Tokyo on Saturday, the day before the club showpiece final and third-place play-off. Like other Chelsea fans, they are counting on Fernando Torres, Frank Lampard, Peter Cech and their team-mates to put on a performance that will give “blue fever” a boost. The FIFA U-20 World Cup typically sees the emergence of talented youngsters who go on to become household names, and the 1999 edition in Nigeria was no different. Iker Casillas and Xavi won their first major title there with Spain, while Brazilian ace Ronaldinho and Uruguay striker Diego Forlan also announced their arrival on the international stage, as did Mexico’s Rafael Marquez, England’s Ashley Cole and Japan’s Shinji Ono with varying degrees of success. Less well known is that at the same tournament a young Croatian by the name of Mihael Mikic began to make a name for himself as a ‘Brazilian-style’ right-back. The 32-year-old, who has played for Dinamo Zagreb and Kaiserslautern among others, remains as attack-minded as ever with current side Sanfrecce Hiroshima, for whom he has been one of the stars of FIFA Club World Cup Japan 2012 thus far. We’ll be playing a Korean team, and the rivalry between Korean and Japanese football is well known. Perhaps that is why, despite his side’s quarter-final defeat to Al-Ahly SC, the Croatian was still upbeat when he spoke to FIFA.com. “The mood in the camp is a mixture of disappointment and pride. We were the better team [against Al-Ahly] and created a lot of chances – we were just lacking when it came to the final ball. That especially applies to me. I should’ve been more precise,” he said self-critically. His smile is in stark contrast to the nasty looking bruise under his left eye, a souvenir from his side’s opening game against Auckland City FC in Yokohama. Such was his influence in that fixture that the vanquished New Zealanders conceded he had been the key to the home side’s 1-0 win. “I always play the same way. When we’re going forward I have to be up there level with the opposition’s rearguard, and when we’re defending I have to get back and form part of ours. I enjoy it but it requires an awful lot of running and is very tough,” he admitted. Yet despite some fine displays, Mikic still rued his team’s fortunes here in Japan. “Our dream was to reach the semi-final and we worked really hard to get there, but life still goes on. Now we need to focus on winning our next game so as to leave a good impression of Japanese football. After that we can finally go on leave,” he said. This ardent admirer of Ryan Giggs would gladly see out his playing days with Sanfrecce, insisting that life in Japan “is beautiful and that the people here are very nice and always willing to help. I don’t think [foreign] people realise the kind of lifestyle we have in Japan or how good the football is. That’s not to mention the fans, who support you through thick and thin and never cause disturbances. They’re part of the wonderful footballing infrastructure that’s been created here,” he said. Although Mikic never played at senior level for Croatia, it is not something he spends time worrying about. “I don’t speculate why it didn’t happen nor do I intend to look backwards; right now I’m the [national] team’s biggest fan.” The player intends to take his coaching badges once he hangs up his boots but insists he has some unfinished business to take care of before that happens. “I want to win two more titles and thus become the most decorated Croatian player of all time. I have 15 so far but Dario Simic has 16. So I need one more… and then another one after that,” he said laughing. When Club de Futbol Monterrey’s attacking spearhead Humberto Suazo picked up an injury in training on Friday, there was understandable concern on the faces of his team-mates and coaching staff alike. Forced to make a tactical reshuffle just two days before his side’s FIFA Club World Cup Japan 2012 quarter-final against Korea Republic’s Ulsan Hyundai, Rayados coach Victor Vucetich came up with a wholly unexpected solution, drafting inexperienced 19-year-old wide man Jesus Corona into the side. He’s a cracking player and it all comes naturally to him. Despite having only made a handful of appearances for the Mexicans and being the sixth-youngest player to compete in the FIFA Club World Cup, Corona was one of the mainstays of the Monterrey midfield and even opened the scoring nine minutes into the game. “I’ve always made goals, but this one was put on a plate for me,” said the teenager of his side-footed finish from the edge of the six-yard box, which followed a slick passing move. “We played pass after pass, then someone slid the ball across and there it was ...,” said the goalscorer, his description of the goal cut short when he is pinched from behind by a giggling Suazo, who made way for Corona after picking up an injury to his right leg. An admirer of former Brazil striker Ronaldo, Corona has been with the Monterrey first-team squad for the last two seasons, though it is only this year that he has begun to figure on the team sheet on a regular basis. The third of five children and an avid baseball fan – taking after his father – he can count on the unconditional support of each and every one of his team-mates, a key factor in the development of any young player. “Coro’s been doing really well. He deserved this opportunity and he didn’t disappoint,” Rayados captain Jose Maria Basanta told FIFA.com. To call Mohamed Aboutrika an Al-Ahly legend is an understatement. Fans of the Cairo side refer to him as an “angel,” an “icon.” Even journalists call him a “man of peace.” They talk about his character and ethics, his humility, how he once refused a high wage because he thought it unfair to the journeyman defender with whom he shared a dressing room. There is something fanatical about the devotion to this attacking midfielder, born in Giza, who has been winning trophies with Egypt’s most successful club for nearly ten years. It must have come as a shock for those fans, then, when Aboutrika, five times named Egyptian player of the year, was left out of the starting line-up for their FIFA Club World Cup Japan 2012 opener against Sanfrecce Hiroshima. With the game tangled at 1-1, and with Hiroshima on the ascendancy, substitute Aboutrika’s cool distribution and foraging runs forward made the difference. And there was an air of inevitability when he scored the winner. He ducked into a good position on the edge of the box and collected a chipped-in ball, bumping his defender out of the way cleverly with his hip. “That goal was important only because it helped Al-Ahly win the game,” he told FIFA.com. “We all play as one and we all succeed as one. It is not about Aboutrika,” the player added, almost apologetic about his exploits. Our goal, and really the most important goal, is to spread happiness for the people in Egypt. “My best wishes go to the great Hossam Ghaly also,” he said, a nod to his injured captain, who will be out for up to six months with torn knee ligaments. Humility aside, the goal was not only important for putting Al-Ahly into the semi-finals, where they will meet Brazilian giants Corinthians. It was also Aboutrika’s fourth goal at a FIFA Club World Cup, putting him at the top of the all-time scorers’ list, right next to one Lionel Messi. When talk turns to Al-Ahly’s fans, Aboutrika’s voice goes quieter still. He scored his winning goal directly in front a giant banner hanging below a noisy bank of supporters, reading “79, never forget.” It was a stark reminder of the 79 fans who died in the February 2012 tragedy in Port Said, following an Egyptian top-flight game between Al-Ahly and Al Masry. Aboutrika decided to retire from professional football when those fans tragically met their end in the port city. He has since changed his mind, and his perspective on football, and its place in the order of what’s important in life, has evolved. “The result isn’t always the main goal, winning and losing,” said Aboutrika, who is closing in on 100 caps for Egypt’s national team. But while Aboutrika does his level best to adhere to the fans’ idealistic notions of him, he is still a footballer, and a footballer wants to win games. Up next is a test against one of the favourites of the competition, Corinthians of Sao Paulo. “We are not required to beat Corinthians, who are a big name in world football, but we must do our best,” he said, suddenly a look of determination rather than supplication and humility. “They are a big team, but we will make our arrangements and do our all to beat them,” he concluded, before shaking hands and wading into a tide of Egyptian journalists, cameras balanced on shoulders, notepads in hand, eager for a word with this humble man of the hour. PAS Youth is calling for the Kinabatangan Umno Youth information chief Aksyah Nasrah to resign as Sabah Election Commision (EC) deputy director of operations if the latter intends to be active in politics. Sabah PAS Youth chief Lahirul Latigu today gave Aksyah ( left ) the ultimatum to either resign from his position in Umno or in the EC so that the public's trust in the institution would not be lost. "He (Aksyah) should resign. We are concerned that when there are people contesting in the general election, we can't trust the EC. "All elements of biasness should be removed. As long as there are people like this, that is Umno members in the EC, trust in the EC will decrease," he said in a press conference at PAS headquarters today. Last Saturday, Lahirul had alleged that there are Umno members in Sabah's EC and asked the commission to explain how it is possible for its officers to hold positions in political parties. Lahirul claimed that such a thing cannot happen as it will affect the EC's credibility as an organisation that is responsible for ensuring the implementation of democracy in this country. However, in a report by The Malaysian Insider yesterday, EC chairperson Abdul Aziz Mohd Yusof ( left ) stressed that EC officers have a democratic right to participate in politics but must be impartial in their duties. "There is nothing wrong for any EC officer to join political parties. It doesn't matter if they are in PAS, PKR or Umno. "It is their democratic right," Abdul Aziz was quoted as saying by the news portal. Thus, Lahirul urged the EC to be more strict in ensuring that there are no politicians in the commission. "He ( Abdul Aziz) said it is no problem. When the ball, the team and the referee are the same, how do we know that it is fair? This individual is an important person in Umno. In my opinion, this should not happen when we are about to face the general election. "The EC should be decisive. There should not and must not be any political party in a free election commission," Lahirul reiterated. PAS secretary-general Mustafa Ali has said that the fines imposed on four non-Muslim by the Kota Bharu Municipal Council (MPKB) last October were not related to Syariah law. Mustafa said that ever since PAS took control of Kelantan in 1990, no non-Muslims have been subjected to such laws. He accused MCA of trying to create an impression that the opposite was true. "This issue is being sensationalised by MCA. We know MCA owns The Star . This is MCA's agenda to garner support from the Chinese community," he told a press conference at the PAS headquarters. "They (the four individuals) when fined for indecent behaviour in public places, not khalwat." Khalwat is an offence under Islamic law for close proximity between an unmarried male and female. The Star had carried a front-page report with the headline 'Khalwat issue heats up' yesterday, claiming that MPKB enforcement officers had used religious reasons to issue summonses to four individuals for "indecent behaviour". According to the report, MPKB had issued a fine on two males, who were in a car, and a teenage couple engaging in a piggy-back ride at a park. On whether PAS will take legal action against The Star, Mustafa said that the newspaper was playing up a small issue and it did not warrant legal action. "It doesn't warrant a suit... It would be a waste of time," he said. The prime minister's wife, Rosmah Mansor, has the right to have as high a profile as she likes, said Dr Mahathir Mohamad. The former premier was asked whether he thinks that Rosmah's profile has become too high compared to that of the wives of previous prime ministers. "There is no standard format to fill if you become the wife of the prime minister. You can be as prominent as you like," he said after an event at the Malaysian Petroleum Club in Kuala Lumpur today. He also said Rosmah has the right to rebut allegations against her via her biography, for which a pre-launch event was held yesterday. The book is said to "honestly answer" issues and defamatory allegations linked to her. "I think if you keep on making accusations against her and she replies, you say 'Well, why do you reply, it's too high profile?' Is she supposed to keep quiet and not reply?" Mahathir said, noting that it all boils down to the people's views on Rosmah. Pressed for his views on her, Mahathir said he has already answered the question. "I have already answered your question; she has every right to answer. You make her high profile by making all kinds of accusations, so she now has to make corrections," he added. Toyota: Sanfrecce Hiroshima failed to advance to the semi-finals of the 2012 FIFA Club World Cup after going down 2-1 to African champions Al Ahly at the Toyota Stadium on Sunday. A roller-coaster first half began with Sanfrecce's first-choice goalkeeper Shusaku Nishikawa stretchered off with a facial injury with just four minutes played after being involved in a collision with bulky Al Ahly striker Gedo. Striker Elsayad Hamdi then helped Al Ahly take the lead inthe 15th minute, converting a pass from Ahmed Fathi before beating Sanfrecce's substitute goalkeeper Takuya Masuda, who didn't play a single J.League game this term. J.League Player of the Year Hisato Sato then equalised in the 32nd minute after he got behind the Al Ahly defence and hit a right-footed shot that deflected in off goalkeeper Sherif Ekramy but Al Ahly's four-World Cup-veteran Mohamed Aboutrika, who came on as a substitute, took a pass from Fathi and scored the winning goal that set a semi-final clash with South American champions Corinthians of Brazil on Wednesday. "In the second half we lost our concentration, the team was tired. Despite that we still managed to create some good chances, but unfortunately we didn't make the most of them," said Sanfrecce coach Hajime Moriyasu. 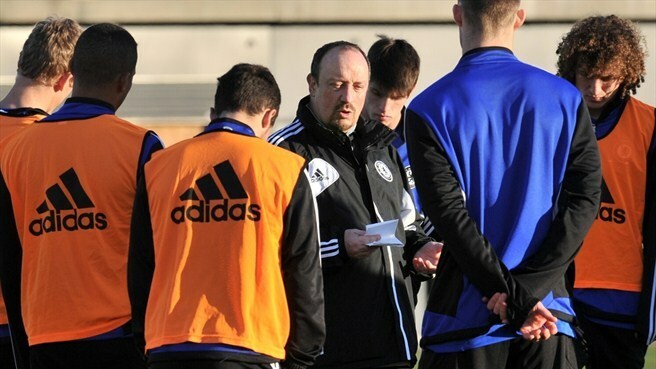 "Now we'll prepare for the match for fifth place against Ulsan Hyundai as best we can. We want to continue to play well here on the international stage. We've picked up a lot of valuable experience against physically strong teams here and have seen that we're able to compete with them." Sanfrecce will battle it out in the fifth place match also on Wednesday against the AFC Champions League winners, who were defeated 3-1 by South American champions Monterrey of Mexico. Kuala Lumpur: AFC Acting President Zhang Jilong and UEFA President Michel Platini on Tuesday put pen to paper on a Memorandum of Understanding (MoU) which will promote cooperation and friendly relations between the two confederations. The MoU will pave the way to exchange information, knowledge and good practices on matters of common interest. "We have a goal to be one of the best confederations of the world and at the moment Asian football is on the rise but there is a long way to go," Jilong said during the signing ceremony organized at the AFC House. "Because of their top qualities in football, UEFA are the benchmark. They can help us raise our standard and I hope this (signing of the MoU) is the beginning. "At the moment we are working on identifying areas where this partnership agreement can be worked upon," he added. UEFA will provide assistance to AFC and its Member Associations in establishing and implementing projects and activities relating to education, training, technical development, refereeing, promotion of grassroots and youth football. It also covers the organisation of competitions, marketing, legal and social responsibility matters apart from promotion of good governance principles in the game. UEFA President Platini was delighted to sign the new partnership with another confederation. "UEFA is delighted to be building stronger relationships with other continental confederations, in this case the AFC, as it allows all of us to share know-how and experience with regard to matters such as coaches' education and grassroots football. "Solidarity is a key value in football and it is therefore important that it is also shown between confederations." Kuala Lumpur: The AFC has a long-standing tradition of cooperation with fellow confederation but the historic Memorandum of Understanding (MoU) signed between the Asian game's governing body and its European counterpart UEFA could mark the symbolic beginning of a new era in relations between the two confederations. The Mou was signed at AFC House in the presence of senior officials from both confederations with FIFA Vice President and AFC Executive Committee member HRH Prince Ali Bin Al-Hussein standing alongside the AFC Acting President while UEFA Vice Presidents Senes Erzik and Marios N. Lefkartis were part of the European delegation. The ground breaking agreement will pave the way to exchange information, knowledge and good practices on matters of common interest ushering in a new era of closer ties between the AFC, whose 46 Member and one Associate Member Associations represent over half the world's population, and UEFA, whose tournaments are amongst the most popular of all FIFA's confederations, with their competitions embraced every bit as much by fans the world over as they are in Europe. Speaking at a media conference following the MoU signing, AFC Acting President Jilong expressed his belief that the agreement will enable the Asian game to develop by benefitting from the vast experience from UEFA. "As UEFA is the benchmark of top quality football, we are proud to have this historical MoU signed with them, this partnership will definitely raise our standard," he said. UEFA President Platini also requested the administration of both the confederations find the appropriate areas related with competitions and technical development. "We just signed the MoU, so the next step for the administration is to identify appropriate areas in competitions or technical development," the legendary French player said. FIFA Vice-President and AFC Executive Committee member HRH Prince Ali Bin Al Hussein also assured Platini about the Asian confederation's commitment. "We will look for the appropriate areas where we can work together and will definitely provide feedback," stated Prince Ali. 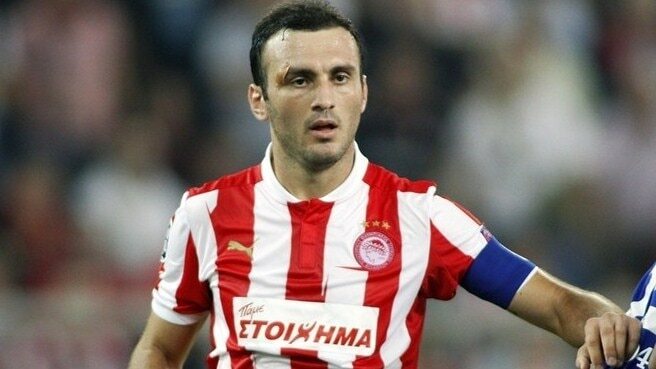 Captain Vassilis Torossidis tells UEFA.com about Olympiacos FC's UEFA Champions League performance, his hopes for the UEFA Europa League and how important the club's fans are. Third-place finishers in UEFA Champions League Group B, Olympiacos FC are now turning their attention to the UEFA Europa League round of 32. In this exclusive interview with UEFA.com, captain Vassilis Torossidis gives his verdict on the Piraeus club's display in the group stage, explains his hopes for the 20 December draw and pays tribute to the club's "exceptional" supporters. UEFA.com: How would you assess Olympiacos' performance in the UEFA Champions League group stage? Vassilis Torossidis: During the first match [a 2-1 home loss to FC Schalke 04], like last season, we didn't manage to achieve the result we wanted. We didn't win, but the most positive thing for us was that we weren't broken by that defeat, nor by the defeat by Arsenal. We then managed to win two matches [against Montpellier Hérault SC] and at least we have third place. We tried to qualify for the last 16 against Schalke, but unfortunately we didn't manage to do it. UEFA.com: After the victories against Montpellier, Leonardo Jardim said he was satisfied with the progress being made by the players. How can these advances help you in the UEFA Europa League? Torossidis: Wins in a tournament such as this can help to develop players' personality, mood and confidence. What is important for the team is that the players did their best during the matches and managed to beat Montpellier. The fact that we did our best against very good teams such as Schalke and Arsenal, while playing away from home, proves that Olympiacos are on a good level and that we try to compete in every match on an equal footing. This could be quite helpful in the Europa League. The teams participating in the Europa League are not as good as the ones in the Champions League, of course, but there are teams in the Europa League who should be playing in the Champions League. I hope we don't play one of them in our first tie in order that we can achieve something positive, like we did last year [when Olympiacos reached the round of 16]. UEFA.com: Is it important for Greek football that Olympiacos perform well in the UEFA Europa League? Torossidis: Of course, it's important for any Greek team – whether it's Olympiacos, Panathinaikos, PAOK or Tripolis – to earn points, first of all for the benefit of Greek football. When any of our teams wins a match, Greece is also a winner. UEFA.com: Who would you like to face in the UEFA Europa League round of 32? Torossidis: My only preference is not to play one of the so called better teams, at least not first up – one that might have deserved to continue in the Champions League. UEFA.com: How important is it for you to play in a full stadium, especially given the economic situation in Greece and the fact that it is not easy for supporters to attend games? Torossidis: Exactly, that's what I was going to say. The fact that our fans come and fill the Karaiskakis Stadium is, of course, important, especially in matches against European teams. That they help us and fill the stadium despite the economic crisis and the problems people face in Greece, is exceptional. In Schalke I saw about 5,000 Greeks who might have deprived themselves or their families of something in order to come and see Olympiacos. Of course, we thank them, since things in Greece are very difficult and the fans, who have many difficulties to face, sometimes put those problems aside and try to find the money in order to come and watch the team. It is very difficult to express in words this situation and what fans sacrifice in this difficult period. The only thing we can do, as a team, is to win matches in order to give them as much joy as we can. A win is our present to the fans for the things they do for us. Lionel Messi continues to add to his list of records with Gerd Müller and César Rodríguez the latest greats to be surpassed by the Argentinian, who scored twice for FC Barcelona. After setting yet more footballing landmarks by surpassing Gerd Müller's haul for club and country in a calendar year and becoming FC Barcelona's record goalscorer in Liga games, forward Lionel Messi insisted that "personal objectives are secondary" to those of the team. The Argentinian was a solitary strike away from reaching former FC Bayern München and West Germany striker Müller's 85-goal mark – set in 1972 – prior to last Wednesday's UEFA Champions League meeting with SL Benfica. However, a knee problem sustained in the scoreless draw at Camp Nou threatened to scupper Messi's record-breaking attempt with four games remaining before the year's end. After his club announced the 25-year-old was merely suffering with a bruised knee, however, Messi quickly recovered to post both goals in his team's 2-1 Liga win away to Real Betis Balompié to take his total to 86 goals for Barcelona and Argentina in 2012. "I was eager to play after the fright I suffered the other day," the 2012 FIFA Ballon D'Or contender explained. "The record is important because of what it stands for but what's crucial is that the team won at a difficult venue and that we have maintained our lead over the chasing pack," he continued. "When we start the year, the goal is to win everything as a team – personal objectives are secondary." Along with overtaking Müller's record, Messi registered his 192nd goal in Liga, taking him past César Rodríguez's previous club best of 190 set in the 1940s and 1950s. The Argentinian eclipsed César's 232-goal, all-time club record last March and has since raised his tally to 283. The Barça youth-team product also holds the record for most goals in a Liga season (50) while his 15-hat-tricks is also a club landmark. A three-time UEFA Champions League winner, Messi sets the standard in that tournament for most goals in a single campaign (14) while he has also been the competition's top scorer for an unprecedented four straight seasons. No other player, meanwhile, can boast of having scored five goals in a single UEFA Champions League game as Messi did against Bayer 04 Leverkusen in the 2011/12 round of 16. UEFA.com takes a look at some future targets for one of the game's greatest players. 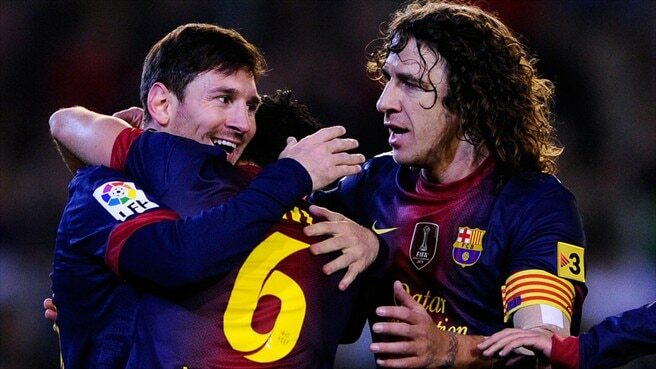 Messi is currently level in second place with Ruud van Nistelrooy on 56 tournament goals. Filippo Inzaghi, Mario Gómez and Messi all currently share a tournament-leading three hat-tricks. With 192 top-flight goals and counting, the Argentinian continues to chip away at the legendary Athletic Club Bilbao forward's tally set between 1940 and 1955. After just 15 top-flight games this term, Messi's total of 23 goals is already one more than he managed at the half-way point in Liga last season. Messi's double in last October's 2-2 draw against Barça's rivals Real Madrid CF moved him to within one of Di Stéfano's mark. With 31 international goals to date, Messi is still some way off 'Batigol's' best. Chelsea FC will attempt to add new silverware to their trophy cabinet over the coming week as they grace the FIFA Club World Cup for the first time, and interim manager Rafael Benítez insists recent disappointments have heightened their hunger but not the pressure. The Blues will kick off their campaign in Japan on Thursday against Mexico's CF Monterrey, the CONCACAF Champions League holders, in the semi-finals. They will do so with the unwanted tag of being the first European team to arrive at the Club World Cup with their UEFA Champions League ambitions already over, but that changes nothing according to Benítez. "I don't have a problem with pressure. The future is the next game and the one after that," said the Spaniard, who was sacked by FC Internazionale Milano days after winning this trophy two years ago. "It doesn't matter if we are in the Champions League or not. It's a great opportunity and we're here to win. We won our last two games and we're playing well." The mood around the camp is certainly upbeat, and having survived an impromptu autograph-signing session in a packed Yokohama coffee shop, goalkeeper Petr Čech spelled out their intent. "We came to win the competition and will try to prove it on the pitch," he said. "You can only play in this competition if you win the Champions League and I've had to wait eight years to get here." If they negotiate a Monterrey side spearheaded by former Olympique Lyonnais winger César Delgado, then Copa Libertadores holders SC Corinthians Paulista or Egypt's Al-Ahly SC await in Sunday's final. "It's a massive competition and everybody here has the same idea as me – to win every trophy." Indeed, this is one of only two major titles Chelsea have not captured. Succeed, and only the UEFA Cup/UEFA Europa League is missing. Seoul, South Korea - North Korea has extended the window for a controversial long-range rocket launch by one week after finding technical problems in an engine, state media reported Monday. The planned launch has been widely condemned by other countries like the United States and South Korea, which say it's cover for testing ballistic missile technology. The North insists the launch is aimed at putting a scientific satellite in orbit. When it announced its plans on December 1, the reclusive North Korean regime said it intended to carry out the launch between Monday and December 22. But on Saturday, the state-run Korean Central News Agency (KCNA) said the launch may be delayed. 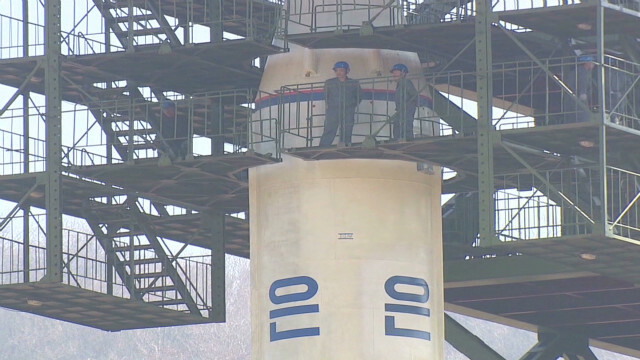 In a new article Monday, KCNA reported that scientists and technicians had "found technical deficiency in the first-stage control engine module of the rocket," citing a spokesman for the Korean Committee of Space Technology. As a result, they have decided to extend the launch period until December 29, the agency said. The problem mentioned by the news report suggests the solution may not be "a quick fix," said Jon Ahn of the Aerospace Engineering Department at Sejong University in South Korea. Analysts have cited a number of possible reasons for Pyongyang's decision to carry out an unprecedented second launch this year, after a failed effort in April, including significant anniversaries related to the reclusive state's ruling dynasty. Previous launch attempts by the North in 2006 and 2009 also failed to achieve their stated goal of putting a satellite in orbit and provoked international condemnation. Pyongyang has said the planned rocket launch would be "true to the behests" of Kim Jong Il, the late North Korean leader and father of Kim Jong Un, head of the ruling regime. Kim Jong Il died on December 17 last year, so the first anniversary of his death falls within the launch window that North Korea has announced. Experts also speculate that Pyongyang wants this launch to happen before the end of 2012, the year that marks the centenary of the birth of Kim Il Sung, the founder of North Korea and grandfather of Kim Jong Un. This is the first time North Korea has attempted a rocket launch in winter, and observers say the timing of preparations and the launch itself will depend heavily on weather conditions. But the snow and freezing temperatures may not be the biggest challenge for the launch, though, according to Ahn of Sejong University. The main issue is likely to be the separation of the second and third phases of the rocket, which bedeviled the botched launch in April, he said. North Korea's uneasy neighbors are watching developments closely. Japan has said it will shoot the rocket down if it threatens any part of its territory. The death toll from the destructive typhoon that savaged the southern Philippines last week has climbed above 700, authorities said Tuesday, warning that the final number may be much higher. Nearly 900 people are still unaccounted for in the aftermath of Typhoon Bopha, the strongest and deadliest storm to hit the Philippines this year, according to the country's emergency management agency. The numbers of dead and missing have risen drastically during the past several days as government officials have gathered information from isolated areas where the scale of the devastation was previously unknown. Both of the grim totals are likely to increase further this week, said Benito Ramos, head of the National Disaster Risk Reduction and Management Council, the emergency agency. Search and rescue efforts are continuing, he said, despite the declining chances of finding people alive. "We are still hoping against hope that there are still survivors," he said by telephone, adding that some of the hundreds of fishermen reported missing after the storm could yet be found sheltering on small islands out at sea. If only a few of those missing are found alive, Bopha could eventually prove more deadly than Tropical Storm Washi, which killed 1,268 people a year ago. But its toll would still remain far below that of Tropical Storm Thelma, the country's most lethal storm on record that left more than 5,000 people dead in 1991. The worst of the death and destruction from Bopha took place on the southern island of Mindanao, where the storm hit first and hardest with gusts as strong as 220 kph (138 mph). In the provinces of Compostela Valley and Davao Oriental, the heavy rain set off flash floods and landslides that engulfed whole neighborhoods, and the winds ripped apart fragile houses. Many residents were unprepared or unaware of the typhoon's threat to the region, which rarely experiences tropical cyclones of such magnitude. 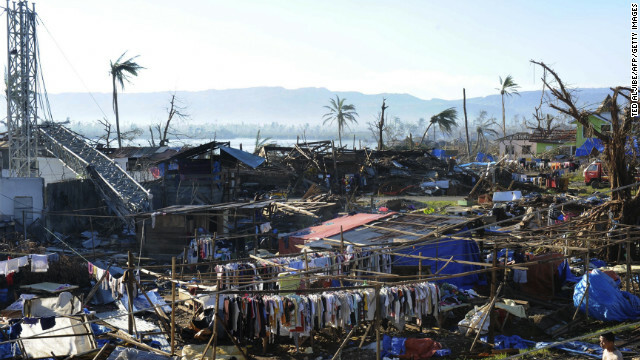 Bopha, known locally as Pablo, was the most powerful typhoon to hit Mindanao in decades. Compostela Valley and Davao Oriental account for the vast majority of the 714 people killed and for most of the 890 still missing nationwide. A week after the typhoon struck, survivors there are facing many obstacles to rebuilding their lives. Hundreds of thousands of people are living in evacuation centers or relying on the government for other kinds of assistance, according to the national emergency agency. And hundreds more, who have not been able to find refuge in the centers, line the roads of Compostela Valley, said Arlo Ramos, a relief worker in the region for World Vision, a humanitarian group. "During the daytime, they stand along the side of the road, they ask for food," he said. At night, they sleep in small, makeshift shelters cobbled together out of bits of wood and canvas scavenged from the debris, he added. In New Bataan, the town at the heart of the devastation, dead bodies are still being found and lined up in an open space in front of an evacuation center, according to Arlo Ramos. When aid workers or government officials arrive in the town, he said, residents crowd around them, hoping to get the food or water they desperately need, he said. The region's prospects for longer term recovery are also bleak, since the storm laid waste to a great deal of the agricultural land on which many residents rely for their livelihood. "Farming communities have been the worst hit and it could take many years for them to fully recover," said Paul del Rosario, the humanitarian program coordinator for the charity Oxfam. The United Nations has announced a global appeal to try to raise $65 million to help those affected by the storm. And Philippine President Benigno Aquino III, who visited New Bataan and other severely affected areas last week, has declared a state of national calamity, which releases emergency funds and puts price controls on basic goods. Finger pointing has also begun among officials over the reasons why so many people lost their lives. Local authorities have been criticized for not anticipating the scale of the destruction. And a member of Aquino's government, Environment Secretary Ramon Paje, has said illegal logging and mining contributed to the landslides and flash floods on Mindanao. Paje has implemented measures aimed at clamping down on logging in Philippine forests. "Several quarters are criticizing the declaration of a total log ban but look at what happened," he said last week, referring to the devastation on Mindanao, according to CNN affiliate ABS-CBN. "It is now proving that we really must stop timber harvesting, especially in our natural forests." JOHANNESBURG, South Africa (CNN) -- Nelson Mandela's current hospitalization is due to a lung infection, authorities said Tuesday. 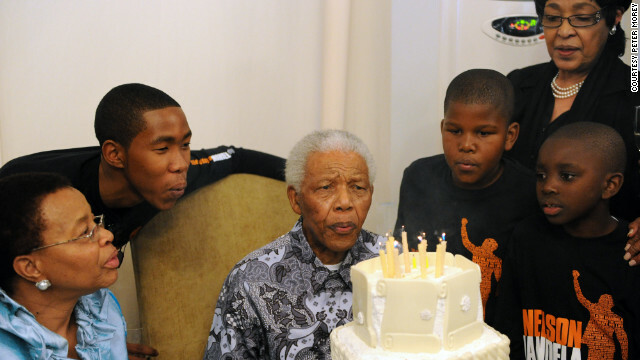 Doctors were treating Mandela and he was responding to treatment, a statement from President Jacob Zuma's office said. Mandela, 94, was hospitalized over the weekend at a Pretoria facility but the exact nature of his ailment had not been released. Tuesday's statement said he had a recurrence of a previous lung infection. Mandela has not appeared in public since the 2010 World Cup hosted by South Africa. The former president gets round-the-clock care after abdominal surgery this year and an acute respiratory infection in 2011. The Nobel Peace Prize laureate spent 27 years in prison for fighting against oppression of blacks in South Africa. He became the nation's first black president in 1994, four years after he was freed from prison. Despite his rare appearances, Mandela retains his popularity and is considered a hero of democracy in the nation. Just last month, South Africa launched a new batch of banknotes with a picture of a smiling Mandela on the front. The new 10, 20, 50, 100 and 200 rand banknotes all feature pictures of the global icon. Brazil is hoping to make the 2014 World Cup "one of the most protected sports events in history," the government said on Wednesday as it announced a $900 million investment in its security forces. It plans to have one police officer for every 50 people attending the soccer matches, and one for every 80 people at public viewing events around the country. "The government has made a program to compile the measures needed for everyone's security. This is an item that we face with much importance," said sports minister Aldo Rebelo. 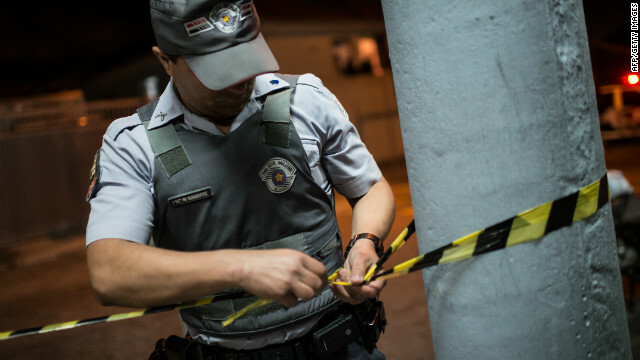 World football's ruling body FIFA has expressed concerns about Brazil's increasing crime rate, particularly in Sao Paulo, as well as worries that the South American nation's infrastructure is behind schedule. "We are seeing a big wave of crime in Sao Paulo, which is not good for its image or tourism," FIFA general secretary Jerome Valcke said last month. Rebelo said the issues are being addressed. "The Sao Paulo government adopted measures and responses for security together with the federal government, who offered help. The actions are being adopted together for the World Cup," he said. Valcke made few friends in Brazil earlier this year when he criticized the lack of progress being made in providing sufficient hotels and transport facilities, and was forced to apologize. He said last month that the problems remain, but acknowledged that steps are being taken. "In one unnamed city there are 17,000 hotel bedrooms and a 45,000 capacity stadium," said Valcke, suggesting that tourists may struggle to find accommodation. "But we have now moved from talking about the problems to talking about the solutions." The Brazil World Cup bid team has increased its security budget as the country prepares to host the tournament for the first time since 1950, as well as next year's precursor Confederations Cup and the 2016 Summer Olympics. It is investing in hi-tech vehicles, helicopters and surveillance equipment, with the $900 million to be spent coming from a wider $15 billion budget for infrastructure. "Security has become an ever-increasing issue for major sporting events in the past decade," the World Cup organizers said in a statement. "This has increased the level of information exchange between countries that have recently hosted events to ensure public safety." 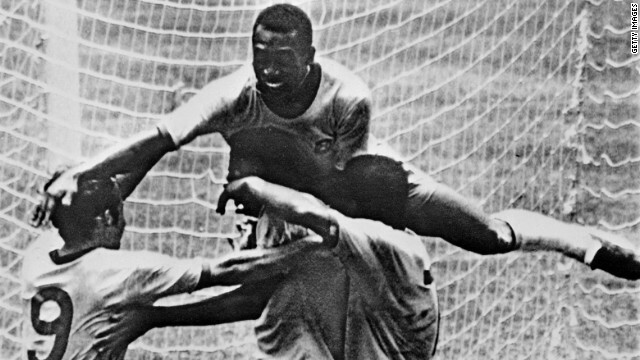 Spain 2012 vs. Brazil 1970: Who's the greatest? The last World Cup was held in South Africa, another country with crime problems. Its government said it invested 640 million rand ($70 million) to deploy 31,000 police officials during the tournament. It set aside a total budget of R1.3 billion ($150 million) for security, and said after the 2010 event it had spent R572 million ($65 million) on crowd control equipment, crime scene trainers, helicopters, water cannons, new body armor and 100 BMWs for highway patrol. More recently, the British government budgeted £553 million ($890 million) on security for the London 2012 Olympics, plus £475 million ($760 million) for army, security services and police spending. It caused outrage with plans to put anti-terrorist rocket launchers on the roofs of civilian homes. London 2012 organizers were forced to bring in armed forces after the Games' private security contractor, G4S, was unable to fulfill its obligations as it did not recruit sufficient workers. Brazil has been taking advice from Canada, which hosted the 2010 Winter Olympics in Vancouver. "That's how it should be done, as we did: learn from those who were in charge of security for other events before us," Royal Canadian Mounted Police superintendent Kevin Bruyckere said. "It's important to make the most of what others have done previously to plan security. The relationship between countries and the law enforcement agencies of these countries is very important. I know Brazil is working closely with the international community." American authorities are examining whether the leader of a post-revolution terror network in Egypt played a role in the September 11 attack on the U.S. Consulate in Benghazi, Libya, according to a U.S. official with direct knowledge of the investigation. Muhamed Jamal Abu Ahmed has been detained by Egyptian authorities; however, the FBI has not yet had access to him, the official said. Asking not to be identified because of the sensitivity of the case, the official says Abu Ahmed came to authorities' attention after the attack and has remained there for "a long time." The source would not comment on what led to Abu Ahmed or on any possible intelligence shared between the United States and Egypt, but an Egyptian security official told CNN there was cooperation between U.S. government officials and Egyptian security authorities. Abu Ahmed, a well-known jihadist, was released from jail after the downfall of Egyptian President Hosni Mubarak. He's believed to be the driving force behind a new terror group seeking to align with al Qaeda, the two officials said. He was arrested by security forces in the province of Sharkia two weeks ago in a house rented under a different name, according to an Egyptian security official. He had two machine guns, ammunition and a laptop. His temporary detention has been extended to 15 days for further investigation. He admitted that he had traveled to Libya several times during the revolution there and joined the resistance but denied any connection to the attack on the consulate or affiliation with al Qaeda, the Egyptian official said. Egyptian intelligence officers believe he has an affiliation with a terrorist cell in Cairo's upper-class Nasr City, where five suspected terrorists were captured after a fierce gun battle with security forces in October. The cell became known as the Nasr City cell. Explosive belts, rocket-propelled grenades, machine guns, hand grenades, rockets and ammunition were found in the flat when the five suspects were arrested. The cell is accused of planning to blow up government buildings, the Interior Ministry and embassies and to assassinate high-profile political figures, according to their statements to authorities and information retrieved from their laptops. 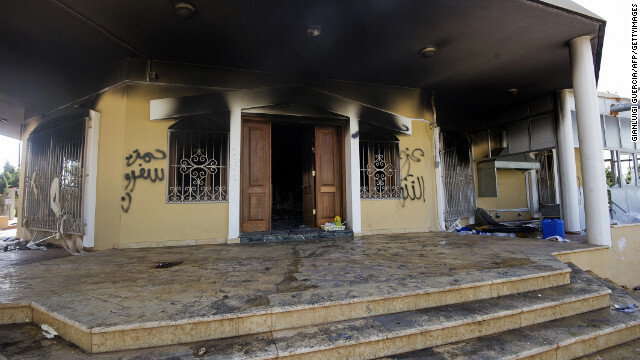 They are also accused of unspecified connections to the Benghazi embassy attack. Muhamed Jamal Abu Ahmed and the five suspects will face trial in a security court soon. Abu Ahmed, 45, who holds a master's degree in sharia law, was imprisoned during the Mubarak era on charges of "conspiring to topple the regime," but was not convicted. He was released from prison after uprisings began on January 25, 2011, and eventually toppled Mubarak. He speaks English, stands about 5-foot-7 and maintains a thick beard. But the U.S. government suspects he may have led a terrorist ring in Libya and provided training and funding for them before ordering them to attack the U.S. Consulate. He denies such charges and claims he was fighting alongside the rebels in Libya. Most of the weapons retrieved in the Nasr City flat are not new in Egypt, but the rockets and explosive belts alarmed the security officials. An influx of weapons arrived mainly from Libya and Sudan during the security vacuum that followed the uprising. Meantime, another possible suspect, Tunisian Ali Ani al Harzi, remains detained in Tunisia. He was picked up in Turkey following the attack on the U.S. Consulate. After weeks of attempting to gain access to al Harzi, the FBI finally met with him in the presence of Tunisian authorities. However, al Harzi refused to talk with American investigators, according to the U.S. official. Hamas political leader Khaled Meshaal called for reconciliation among Palestinian factions but offered a singular vision that does not recognize Israel and remains committed to armed struggle. Meshaal, in exile for 45 years before visiting Gaza this week, spoke on the 25th anniversary of the founding of Hamas. Reconciliation was a key theme. He called for a singular Palestinian leadership led by the PLO, but he was unbending in his support of Hamas' goals. "Palestine is ours from the river to the sea, from the north to the south," Meshaal said. "It is our right, our homeland. We will not give up any inch or any part of it." The Hamas leader's provocative speech came two weeks after a bloody fight with Israel that left the group energized and emboldened. The goal of Hamas is an Islamic fundamentalist Palestinian state. Its manifesto advocates the destruction of the state of Israel and calls for the raising of "the banner of Allah over every inch of Palestine." Israel, the United States and other Western countries label Hamas a terrorist organization. The United States also has listed Meshaal as a terrorist since 2003. Palestine is an Arab and Islamic land, Meshaal said, and "it is for us, not for others." Meshaal spoke to a packed crowd that waved green Hamas flags, but the leader spoke of wider unity under the Palestine Liberation Organization, chaired by Mahmoud Abbas. Abbas' Fatah movement and Hamas have often been at odds politically and militarily following Hamas' electoral victories in Gaza. The Palestinians need "one government, one authority, one legislative council," Meshaal said. Abbas, who is the president of the Palestinian Authority, has sought to advance a Palestinian state through diplomatic means, most recently by securing an upgrade at the United Nations for his people to nonmember observer state. "It is a small step, but a good one," Meshaal said. But it was clear Saturday that the Hamas leader's preferred strategy remains armed conflict. "The jihad and military resistance is the road and is the real and correct way to liberate Palestine," he said. Political, diplomatic and legal struggles are necessary, he said, but they all follow military efforts. Meshaal, who has led Hamas from exile since 2004, was making his first visit to Gaza and his first to the Palestinian territories in 45 years. He left the Palestinian West Bank in 1967 at the age of 11 after Israel moved into the territory during the Six-Day War. Israel, under Prime Minister Benjamin Netanyahu, attempted to assassinate him in 1997. If there existed a peaceful path to a Palestinian state, Hamas would follow that path, but it is not an option, Meshaal said. He described the recent eight-day conflict with Israel, where rocket attacks were met with Israeli airstrikes and which ended with a cease-fire, as a victory for Hamas in Gaza. Gaza stood fast and surprised the Israelis with their attacks, he said. "Bless those hands who fired missiles upon Tel Aviv," he said. "This is how victories are made." Meshaal also was unequivocal that while he seeks Palestinian unity, Hamas would not shift its position on not recognizing Israel. A Palestinian state should never have to recognize what Hamas considers to be an occupying power, he said. The U.S. Treasury imposed sanctions Tuesday on leaders of the jihadist al-Nusra Front in Syria, hours after the State Department moved to blacklist the rebel group as a foreign terror organization linked to al Qaeda in Iraq. The Treasury also sanctioned two armed militia groups that operate under the control of the Syrian government, Jaysh al-Sha'bi and Shabiha, it said. Syrian opposition groups have voiced their opposition to the U.S. move against the rebel fighters, suggesting that they are being targeted because they oppose a new anti-government coalition. In recent months, the radical Islamist al-Nusra Front has emerged as one of the most effective groups in the Syrian resistance, drawing on foreign fighters with combat experience in Iraq and elsewhere. But Washington accuses the group of using the Syrian conflict to advance its own ideology and ends. State Department spokeswoman Victoria Nuland confirmed Tuesday that al-Nusra Front had been added to the list of aliases for al Qaeda in Iraq, already designated a foreign terrorist organization. She said the group had claimed nearly 600 attacks in the past year, including suicide bombings, in several cities and was responsible for the deaths of "numerous innocent Syrians." Al-Nusra "has sought to portray itself as part of the legitimate Syrian opposition while it is, in fact, an attempt by AQI to hijack the struggles of the Syrian people for its own malign purposes," she said. The designation makes it illegal for any U.S. citizen to give "material support or resources" to al-Nusra fighters, including money, training and weapons. The Treasury's financial sanctions also target two senior al-Nusra leaders named as Maysar Ali Musa Abdallah al-Juburi and Anas Hasan Khattab. The measure means that any assets they may hold in the United States are blocked and that U.S. citizens are barred from doing business with them. Two Shabiha commanders, named as Ayman Jaber and Mohammad Jaber, were also designated by the Treasury Department alongside the two pro-government militia groups. Its statement said the Shabiha have "operated as a direct action arm of the government of Syria and its security services," working alongside its intelligence services, and have been "complicit in the commission of human rights abuses in Syria, including those related to repression." "Since the beginning of the unrest, the Shabiha have fired into crowds of peaceful Syrian demonstrators, shot and killed Syrian demonstrators, arbitrarily detained Syrian civilians, and shot Syrian soldiers who refused to fire on peaceful demonstrators," it said. The Jaysh al-Sha'bi militia has "conducted unilateral and joint operations with Syrian military and security elements against the Syrian opposition" that have led to the deaths of opposition members, the statement said. It accuses Iran of training, funding and arming the Jaysh al-Sha'bi militia. Washington's move comes a day ahead of a Friends of Syria meeting scheduled for Wednesday in Morocco. The goal of the designation is to isolate extremist groups in Syria while giving a boost to the new political opposition group unveiled last month in Doha, Qatar, U.S. officials said last week. Al-Nusra and several other groups last month announced their opposition to the National Coalition for Syrian Revolutionary and Opposition Forces, a new anti-government coalition. U.S. officials estimate al-Nusra members represent about 9% of rebel forces in Syria. The Syrian Observatory for Human Rights, a London-based opposition group, said fighters from the al-Nusra Front were among rebel forces who it says have seized control of a government military base in the Sheikh Sleiman area of western Reef Aleppo. But their designation as a foreign terrorist group isn't being made on the grounds of past or possible future actions, according to the Observatory's Rami Abdelrahman. "The United States decided to single out the Nusra Front because of their recent rejection to the political opposition front and (because) they have a different approach to post-Assad's Syria," he told CNN. Syrian Minister of Information Omran al-Zoubi told Lebanese al-Manar TV on Monday that Damascus understood why Washington wanted to blacklist the al-Nusra Front. "When the U.S. places Jabhat al-Nusra on the international terrorist organizations list, that is because it realizes the nature of these groups which are fighting the Syrian armed forces," he said. Syrian President Bashar al-Assad has characterized the nearly 21 months of violence that have ravaged his country as a fight against terrorism. But the Syrian National Council, a largely expatriate opposition group, on Sunday voiced its "full rejection of any accusation of extremism and terrorism to any of the forces that are fighting the Syrian regime." Any accusations made against factions within the Free Syrian Army, which brings together disparate groups, were intended to cause division within its ranks and between its forces and the Syrian people, it said. "Terrorism is a characteristic that can only be attributed to the Syrian regime," it said. U.S. officials have previously said the jihadist al-Nusra Front has not affiliated itself publicly with al Qaeda in an apparent effort to appear more mainstream. The group has claimed responsibility for complex attacks in Damascus and Aleppo, frequently involving suicide bombers. CNN is unable to confirm casualty reports as the government has severely restricted access by international journalists. The meeting in Morocco this week follows a renewed international push for a diplomatic solution to the crisis in Syria, amid concerns about the potential use of chemical weapons. U.S. Defense Secretary Leon Panetta told reporters Tuesday, however, that intelligence about new attempts by Syrian government forces to move chemical weapons "has really kind of leveled off." U.S. officials said last week that they had seen intelligence suggesting that Syrian military units might be preparing chemical weapons for use, prompting strong warnings from international figures. "We haven't seen anything new indicating any aggressive steps to move forward in that way," Panetta said. "But we continue to monitor it very closely, and we continue to make clear to them that they should not under any means make use of these chemical weapons against their own population. That would produce serious consequences." Panetta said he would like to believe that al-Assad has gotten the message: "we've made it pretty clear and others have as well." But, he added, "You know it's also clear that the opposition continues to make gains in Syria, and our concern is that if they feel like the regime is threatened with collapse that they might resort to these kinds of weapons." President Barack Obama has said that any use of chemical weapons would cross a "red line," eliciting a swift U.S. reaction. Syrian state-run media said Monday that the United States has falsely accused Syria of considering the use of chemical weapons. Meanwhile, the United Nations refugee agency, the UNHCR, said Tuesday that it had either registered or was in the process of registering more than half a million Syrian refugees in Lebanon, Jordan, Iraq, Turkey and North Africa. The numbers are climbing by more than 3,000 per day, said spokeswoman Melissa Fleming. Cairo (CNN) -- Competing protests for and against Egyptian President Mohamed Morsy were planned for Tuesday evening, as a controversial vote neared. Tensions have run high since the president announced a controversial decree in late November expanding his decision-making powers beyond judicial review. Morsy has since partially dropped the decree, but opponents remain on edge ahead of a Saturday referendum on a divisive draft constitution. Evidence of the tensions surrounding the vote could be seen in measures that the government has announced days before the vote. On Tuesday, Morsy amended a law so that voters cannot cast their ballots outside their electoral districts, as they had in the past. Being able to vote anywhere had been a convenience, a presidential statement said, but it creates a burden on electoral officials. The purpose of limiting voting to one's own district avoids "concerns about the fairness of the electoral process," the statement said. Earlier, the government granted the military the power to make arrests during the electoral period, a power previously limited to police. The move is designed to secure the voting process and will be rolled back once the election results are published, presidential spokesman Yasser Ali said. The government is also allowing Egyptians living abroad to vote at 150 Egyptian embassies and 11 consulates worldwide, officials said. As many as 586,000 expats are registered to vote in the referendum. Islamists formulated and voted to approve the national charter before handing it off to the general public to vote on, as representatives of other political and religious backgrounds quit the process in protest. Before the separate but competing rallies Tuesday, attackers injured nine protesters with bird shot pellets in an assault on Tahrir Square in central Cairo before dawn, a Health Ministry official said. Four were hospitalized with critical injuries, Dr. Mohamed Sultan said. Dozens of assailants stormed the roundabout from three directions at 1:30 a.m., throwing Molotov cocktails and firing bird shot at protesters, said Mohamed Harbia, an activist who spent the night at the square. Two protesters were wounded in the chest and one in the groin, said Harbia, who complained that ambulances took half an hour to arrive. KUALA LUMPUR: The Westports Malaysia Dragons are ready to breathe fire in the new Asean Basketball League (ABL). For the new season on Jan 11, the Dragons, who were beaten in this season’s semi-final playoffs, have signed two more Americans – Cedric Bozeman and Gavin Edwards – to beef up their squad. Moala Tautuaa is the other American in the squad. The 29-year-old Bozeman and Gavins, 24, are replacing Brian Williams, who has joined ABL runners-up San Miguel Beerman, and Tiras Wade. Together with shooting guard Patrick Cabahug, the Dragons have now filled four spots in the imports list. They have one more spot for an Asean import. Bozeman comes with strong credentials, having played for the Atlanta Hawks in the NBA from 2006-2007 and the Barangay Ginebra Kings in the Philippines Basketball Association (PBA) Conference earlier this year. Dragons head coach Ariel Vanguardia is also happy with the players at his disposal. “We have (Ooi) Ban Sin joining us and that will beef up the point guard department. I’m happy with what I have now. “I’m still not sure whether to bring in another guard or a big guy,” said Vanguardia. “We have a few names lined up and I will finalise the roster by the time the Agong Cup (Dec 13-20) ends. “I hope the American imports will stay fit and healthy throughout the season to give us a better shot at the title,” he added. The Dragons will start the ABL season away at Saigon Heat on Jan 12 before playing their first home game against Jobstreet.com Singapore Slingers on Jan 15. The Dragons also received a major boost in the build-up to the season. They have signed a three-year sponsorship with Budweiser. KUALA LUMPUR (Reuters) – The two rival factions that are set to land Indonesia a FIFA suspension this week have only got themselves to blame for the mess, AFC executive committee member Prince Ali bin Al Hussein said on Tuesday. The Indonesian football federation (PSSI) failed to hold a congress attended by the rival Indonesian Soccer Rescue Committee (KPSI) on Monday, a deadline set by FIFA, with the world governing body set to punish the Southeast Asians at its executive committee meeting in Japan on Friday. If, as expected, Indonesia are suspended it will close a chapter, but not the story, on a turbulent period of football governance in one of the world’s most populated countries. At one point, the country had two national teams and still has two domestic leagues with players blocked from competing in the other, but the comical nature of the events took a serious turn with the death of Paraguayan striker Diego Mendieta from a viral infection last week. Mendieta died in hospital awaiting four months’ wages from his former club Persis Solo, who play in the KPSI-run league, with the PSSI refusing to help cover the debt as they did not recognise the league. FIFA vice-president and AFC executive committee member Prince Ali believes the pair should have patched up their differences long ago. "I have seen how important football is to the people of Indonesia and this issue has to be sorted out," Prince Ali told Reuters in Kuala Lumpur on Tuesday after the signing of a memorandum of understanding agreement with European counterpart UEFA. 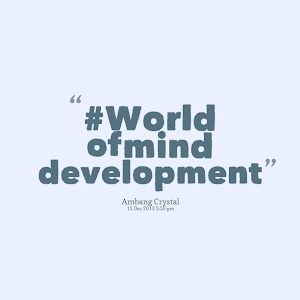 "You cannot have two leagues in one country and that is a fundamental issue that has to be resolved. "We have tried our best with the task force the AFC has set up, it is trying its best to do this but this horrible tragedy with the death of this player is just another example of why this issue has to be sorted out and sorted out immediately." The PSSI has agreed to pay to fly Mendieta’s body back to his family in South America but the damage of the duo’s squabbling has affected many others. The PSSI and KPSI had looked set to bury the past after signing a memorandum of understanding in June at the headquarters of the Asian Football Confederation where they agreed to run one league next season and hold a congress by December 10. But in what has become common practice, the PSSI held a congress in a hotel in Central Kalimantan on Monday while the KPSI held its at the same time in Jakarta, local media reported. Prince Ali, also the head of Jordanian football, said the two groups had forgotten their mandate. "I think all the stakeholders in football need to realise that if they want to serve their people they have to sort out their differences and we will be discussing the situation in Tokyo during the FIFA Exco," the Jordanian added. "I think all stakeholders now have to take it very seriously. Obviously the only people that will suffer from it will be the people who love the sport." ROME (Reuters) - A homemade explosive was planted in a branch of UniCredit bank in central Rome on Tuesday but an employee doused the lit fuse before it could ignite, police said. The bank is in the same building as Italy's highest appeal tribunal and whoever planted the container of explosive alcohol would have had to pass through the court's security checkpoints. Rudimentary bombs made from cans of gasoline were also discovered outside another bank, Banca Toniolo, southeast of the capital, Italian media said. A note attached to them read "Fire to the banks" and "Anarchy". It was not immediately clear who had planted the devices. Many Italians believe banks carry the blame for their country's economic crisis because taxpayers were forced to bail out several lenders across Europe. The country has seen a string of attacks claimed by a group that calls itself the Informal Anarchist Federation (FAI), including a letter bomb that blew off the finger of a tax agency director. ZURICH (Reuters) - Swiss police said six people were taken to hospital on Tuesday following a chemical leak at a Novartis pharmaceutical production site in Schweizerhalle near Basel. The police said in a statement that the leak of a corrosive chemical occurred at approximately 1040 GMT on Tuesday affecting 13 people, six of whom had to be taken to hospital, suffering from the effect of inhaling the chemical. Police said there was no danger for people outside the Novartis site. DUBAI (Reuters) - The prison sentence of a prominent Bahraini rights activist jailed for taking part in unlicensed protests was cut by a year by an appeals court on Tuesday, his lawyer said. In a case criticised by rights groups, Nabeel Rajab, founder of the Bahrain Centre for Human Rights, had been serving three years for leading protests against the wide powers of the Sunni Muslim al-Khalifa dynasty which rules the island kingdom. Bahrain, the base of the U.S. Navy's Fifth Fleet, has been in turmoil since the pro-democracy protests led by its Shi'ite Muslim majority erupted last year. Washington has called on its ally to talk to the opposition. A hero to protesters but a villain for those Bahrainis who fear the protests will bring Shi'ite Islamists to power, Rajab was originally sentenced by a lower court in August, a verdict Washington said was deeply troubling and rights campaigners called a "dark day for justice". The judge ruled in three cases on Tuesday, all related to participating in peaceful protests, and handed Rajab a one-year jail sentence in one case and six months each in the other two cases, said lawyer Mohammed al-Jishi. He said Rajab had yet to decide whether to appeal again, adding: "It is a very harsh verdict." "We were expecting the judge to issue one sentence for the three cases collectively, but he treated them as three separate cases and each had a separate sentence," Jishi told Reuters by telephone from Manama. Tuesday's hearing was attended by monitors from rights groups and foreign diplomats, Jishi said. The Bahrain government's Information Affairs Authority said in August the charges against Rajab had been related to violence. Public prosecutors had said Rajab's participation in marches and "provocation of his supporters" led to violence, including throwing petrol bombs and blocking roads. Rajab has been in jail for about seven months for other charges, Jishi said. Since April, the authorities have stepped up efforts to crack down on unrest. Activists cite an increased use of shotgun pellets, whose use officials have declined to confirm or deny. In November, Interior Minister Sheikh Rashed bin Abdullah al-Khalifa said the Gulf Arab kingdom had temporarily banned all rallies and gatherings to ensure public safety and stability are restored. Several activists have been jailed for organising or taking part in unlicensed anti-government protests. Bahrain's ruling family used martial law and help from Gulf neighbours to put down last year's uprising, but unrest has resumed. The opposition says that little progress has been made towards its demands for reforms including a parliament with full powers to legislate and form governments. Many Shi'ites complain of political and economic marginalisation, a charge the government denies.